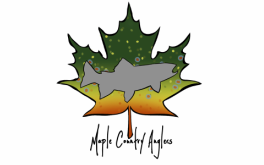 Welcome to Maple Country Anglers! My name is Ben Wilcox, the owner/guide of Maple Country Anglers. 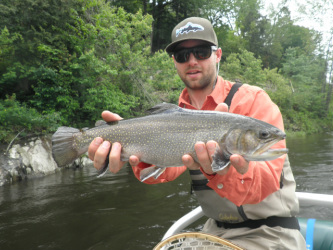 Maple Country Anglers is a fly fishing guide service based out of the Burlington, Vermont area. I guide in Northern and Central Vermont, but I also offer wilderness fly fishing trips in the Rangeley, Maine area during certain times of the year, however most of our guiding is done within an hour of Burlington. I grew up just outside of Burlington, VT. I headed to the University of Maine for college and spent a total of 6 years in Maine, long enough for me to discover that VT is the place I wanted to live. I feel very fortunate and be able to show you my home state, home waters, and share with you my passion for fly fishing. It is my goal to not only help you catch fish, but to share with you my knowledge of the sport and the area we are fishing. I am a fully licensed and insured Professional Guide. Vermont has no standards nor requirements to guide within the state; anyone can claim to be a "guide" here. For this reason it is important to put your trust in a guide and company with the experience, training and knowledge to safely ensure a great outdoor experience. I have been a Registered Maine Guide (license # 5165975) for 10 years, and am certified in Fishing, Hunting, Outdoor Recreation, and Commercial Boat Operation. 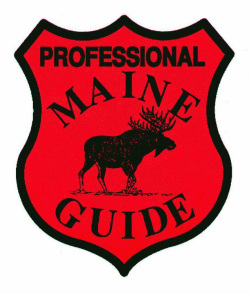 Earning the Maine Guide Patch is a coveted achievement in the Northeast. Guides are trained and examined in all aspects of outdoor activities including Navigation, Boating and Canoeing, Map and Compass, Wilderness first Aid, Lost Person Scenario's, Client Care, General Outdoor Knowledge, Laws and regulations. Candidates are required to complete a lengthy written test in each discipline they are applying for and pass a map and compass test before being examined in person by a board of highly esteemed Maine Guides. Candidates only receive their license upon formal approval by the board. As a Maine Guide I assure you that you are putting your trust in a trained professional. Additionally, I am a member of the Vermont Outdoor Guides Association. I have also completed Guide School at Maine's Outdoor Learning Center and completed Orvis' Advanced Fly Casting School, and am a proud member of Trout Unlimited. Most recently I have taken up competitive fly fishing tournaments, taking 3rd place in the 2018 Fly Fishing Team USA Regional in PA, as well as top 10 finishes in NY, PA, and ID. I Also took the first place Pro Division in the 2015 White River Open Fly Fishing Tournament. I am currently ranked 4th place in the Fly Fishing Team USA points standings, and hope to make fly fishing team USA in 2020 by finishing in the top 15 in the USA. Competing in these tournaments allows me to learn from the very best in the world and bring that knowledge to my clients first hand. Fishing has always been an important part of my life. My parents frequently tell the story of the first fish I caught, a huge sheepshead which I dragged around the lawn for days. I was too young to even remember, but it clearly started a love affair with fishing and the outdoors. These days, it is all catch and release for myself and clients, but I thoroughly enjoy photographing our catches for years of memories. I have fished all over the east, most states of the Rocky Mountain West and Pacific Northwest as well as Hawaii, Alaska, and many Canadian Provinces. I live in Essex, VT with my wife who is my number one fishing partner, a black and white mutt, and our three kids 4 and under. We hope to continue the tradition of fishing and hunting with them. Additionally, I own a large organic maple sugaring business with my father on around 500 acres in Underhill, Vermont called Amber Ridge Maple. I am fortunate enough to own a seasonal business that allows me most all of fishing season on the water. I have been a lifelong fisherman and outdoor enthusiast. As a youngster I was always fascinated with catching fish. I guess it’s fair to say I’ve had fishing in my vocabulary for a very long time. While I didn’t begin to fly fish exclusively until 2007, I did have the pleasure to learn the sport of fly fishing from my grandfather who taught me patience and to care for the river and the trout that inhabit them. I have invested years into learning as many pieces of water in Vermont as possible and the techniques in which to employ to fool our native and wild trout species. This has paid off for clients and myself by being able to fish productive water in just about all conditions. While I focus most of my attention on trout, I do enjoy and am knowledgeable in catching other warm water species. I am CPR certified and have been fortunate in the past to be taught the art of guiding from some of VT's best fly fishing guides. Since 2013 I have been a guide in Vermont covering water from the Otter Creek up to the Lamoille River. In 2018 I began guiding trips for Maple Country Anglers, joining longtime childhood friend Ben Wilcox. Both of us share the love of fly fishing and are excited to be able to share what we love with others. I am also an active member in Trout Unlimited and volunteer for Project Healing Waters. I have and participated in several local fly fishing tournaments and plan to continue servicing the fly fishing community through fly tying lessons and volunteering. During the winter months I work full time at Essex Middle School while squeezing in time to fish for Steelhead and prospect winter trout lies. I live with my girlfriend enjoy the season activities of skiing and snowboarding, hiking, and camping (usually within range of a trout river).